The current government shutdown has lasted long enough to temporarily erase all the positive stimulus effects of recent major legislation. Chairman of the Council of Economic Advisers Kevin Hassett recently said the shutdown reduces quarterly annualized economic growth by 0.13 percentage points for every week that it lasts. After more than four weeks, that’s the equivalent of a 0.6 percent reduction in the annualized growth rate (roughly 0.2 percent in Q4 of 2018 and 0.4 percent in Q1 in 2019). 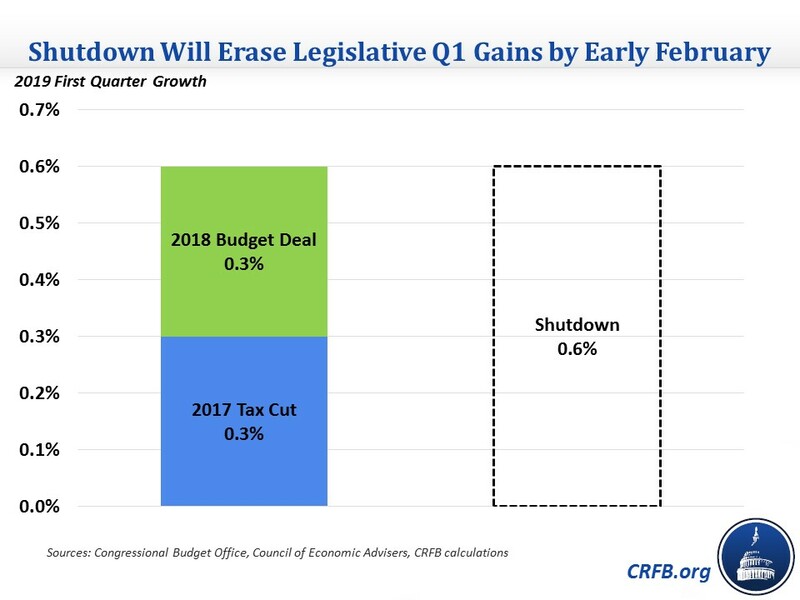 This means that the shutdown has roughly offset a quarter’s worth of estimated economic gains from two major pieces of recent legislation: the 2017 tax law and the 2018 budget deal. As we’ve shown before, the deficit-financed nature of these bills provided significant short-term stimulus, though they will do little to boost GDP over the medium and long terms. CBO estimates suggest they will each increase GDP growth by 0.3 percent per year in 2018 and 2019. Thanks to the shutdown, a quarter’s worth of that growth may now be gone. While this economic hit is short-term, it comes with no upside. Were policymakers to cut spending this quarter, it would slightly shrink the economy in the short term but – by reducing the deficit – improve long-term growth. However, the shutdown reduces government services without reducing government spending and thus it will have no positive long-term effects. At best, some of the economic losses from the shutdown may be recovered. At worst, the shutdown could lead to an extended loss in confidence even after the government reopens. Regardless, the economic cost of the shutdown is both real and senseless.